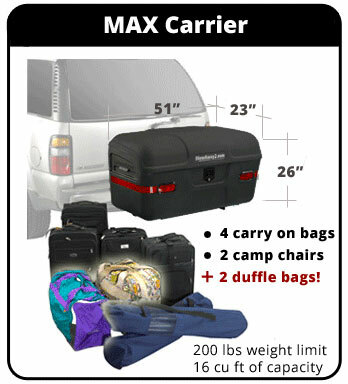 The MAX Cargo Box is StowAway's most popular cargo box for sale. This StowAway cargo carrier offers 16 cubic feet of weather-resistant storage, 25% more capacity than the Standard model. Ideal for extra camping, fishing, or sports equipment, the MAX trailer hitch storage box helps organize and simplify long-distance trips or weekend getaways with the family. All of StowAway's cargo boxes are built from the same high-impact polymer used to make white water kayaks. That means these StowAway MAX Cargo Boxes are extremely durable. Built to endure daily use, season after season, the StowAway MAX Cargo Carrier makes it so you and your travel companions never stop adventuring. Note: Max Cargo Boxes for sale are supplied without mounting holes. If you want mounting holes for one of our frames please indicate so on your order. For vehicles with exhaust pipes pointing straight back, we recommend using and exhaust pipe tip or one of exhaust shields to divert the exhaust away from the box. We have a Roadtrek camper conversion van and the Stowaway 2 allows us to store items that are either bulky and used infrequently like our inflatable kayak or messy items like camping firewood in an accessible storage container that can be easily swung away from rear doors of the Roadtrek to allow access to the storage under the bed or dinette seating. The product is great, as described. The customer service was out of this world! Swing away arm is heavy duty, box is well made, can be a little awkward to open and keep from swinging to far to open your tailgate. But overall happy with purchase. I mounted the license plate light in side with a 12 volt switch for interior lighting works great. Box was high quality. Works great. I WAS IMPRESSED WITH THIS CARGO BOX RIGHT OUT OF IT'S SHIPPING BOX . IT'S STRONG YET NOT HEAVY AND I LIKE THE LOCK DESIGN . THE PRICE OF THE MAX MAKE IT AN EVEN BETTER CHOICE OVER THE COMPETION . I PURCHASED AN ALUMINUM CARRIER FROM HARBOR FRIEGHT REMOVED THE RAILING AND SECURED THE MAX BOX TO IT . I DESIGNED SOME COLLASPABLE WHEELS TO THE UNDERSIDE SO I DON'T HAVE TO LIFT IT . PERFECT !